The BMW Group is clearly committed to its sustainability strategy, they are focusing strongly on electric mobility. No where is this more evident then at the recent launch of their all-new BMW C evolution electric maxi scooter. BMW i3’s replaced the customary 7-Series chauffeured-driven cars for airport collections and electric-assisted BMW mountain bikes were available for commuting around the venue. The i3, a zero emissions fully electric car is currently on sale in Ireland, this July it will be joined by BMW’s i8 supercar. 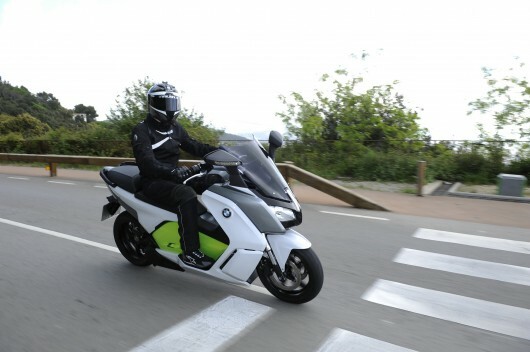 BMW Mottorad, the motorcycle division of BMW is also concentrating resources on producing electric mobility, harmonising some of the technology developed to produce the i3. 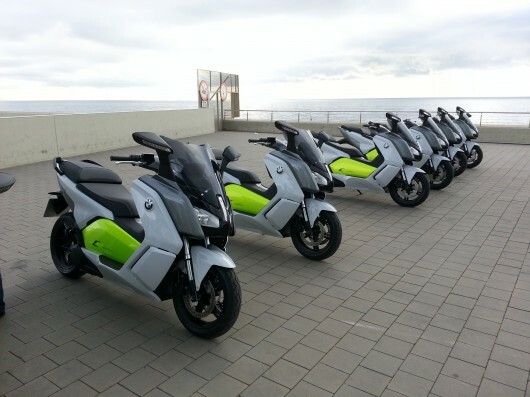 The C evolution maxi scooter joins their current petrol-powered maxi scooters, the C 600 Sport and C 650 GT. Its styling is in-line with its conventionally-powered siblings, albeit with a distinct white and green colour scheme. Development of the C evolution commenced in 2009 with the design team attaining permission from the Board of BMW AG to produce the motorcycle at the end of 2010. The team behind the C evolution used as many synergies as possible with the i3. 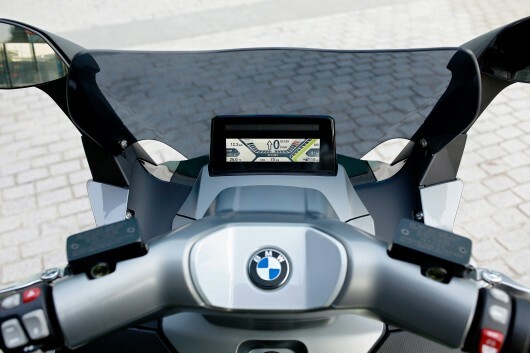 Speaking at the International launch, Dorit Mangold, Product Manager said, “the most difficult design obstacle was accommodating the battery modules as used in the i3 into the maxi scooter, the i3 car has eight module blocks, and the C evolution has three of these”. In order to accommodate them BMW’s engineers designed an aluminium case to encompass them, it also acts as a structure forming the mainframe, with the rear single-sided swing arm attached to the rear of the case, the front has the steering head support attached. 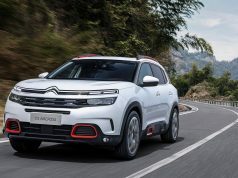 The high voltage battery is air cooled, with a liquid cooled electric motor that produces 11kW (15hp), with a peak power output of 35kW (47hp) and 72Nm of torque. This power is transferred to the rear wheel by way of a toothed belt and ring gearing. This enables to C evolution to reach an electronically limited top speed of 120km/h, with a realistic 100 kilometre range. When you first ride the bike, the most impressive and notable feature is the sheer acceleration from a standstill. The entire bike’s torque is available from zero rpm resulting in initial acceleration unlike any petrol-powered alternative. 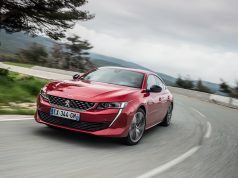 It’s just as well it has traction control and ABS fitted as standard, with a handful of throttle on a wet road it will be effortless to spin the rear wheel. BMW’s traction control is in fact a torque control assist (TCA), it limits the motor’s torque depending on the slip detected at the rear wheel. When riding the C evolution you can choose one of four riding modes, Road, Eco Pro, Sail and Dynamic. All modes apart from Sail encompass energy regeneration to extend battery life, this occurs automatically when you close the throttle and under braking. In Road mode you have maximum power available with approximately 50 per cent energy regeneration when coasting, in Eco Pro mode this is maximised although acceleration is restricted with a noticeable lack of power in comparison to the other modes. Energy regeneration only occurs in sail mode under braking, therefore there is no braking torque experienced when you close the throttle. This is a slightly disconcerting feeling when you first ride the bike in this mode, and really only practical on main roads or motorways. The final mode and the one I selected for the majority of my ride is Dynamic, this furnishes the rider with full power and a large degree of drag torque under braking and with the throttle closed. Our test route encompassed the heaving city streets in Barcelona and the surrounding hillside. The C evolution is at home in the city, with rapid acceleration, albeit eerily quiet, easing progress. Barcelona is a hub for scooter transport, there’s suitable infrastructure in place too, with hundreds of parking bays dotted along its streets. At present there are approximately 200 charging stations around the city, all of them free to use. You can charge the C evolution with a standard 220 volt household socket, a full recharge from empty will take approximately four hours. Its handling is balanced and predictive with a fair degree of feedback evident when you increase your pace on twisty sections of road. There’s virtually no additional weight felt when riding in comparison to its petrol-powered siblings, it’s just 16 kilograms heavier then a C 600 Sport. With twin front brake discs and ABS the C evolution can shed its speed swiftly. When the first electric cars went into production manufacturer’s claims of their range capability were and in some cases still are mostly unachievable. Thankfully BMW Motorrad’s 100 kilometre range is achievable, even riding in a manner far from smooth eco-friendly, for parts of our test route. A TFT colour display screen gives the rider an abundance of information such as current speed, estimated remaining range in kilometres and a bar graph showing the current level of power consumption and energy regeneration. Other onboard features include a helpful reverse assist, and a parking brake that’s activated when the side stand is deployed. 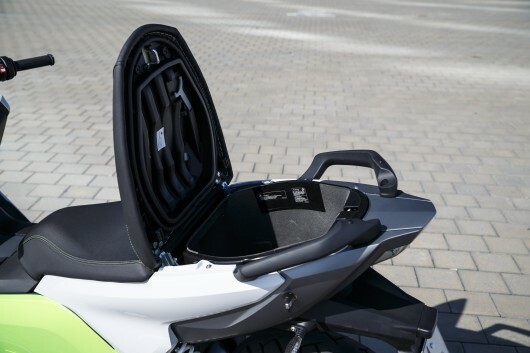 There’s a decent-sized storage compartment under the pillion seat that can accommodate a full-face helmet, along with a practical storage pocket below the handlebars. 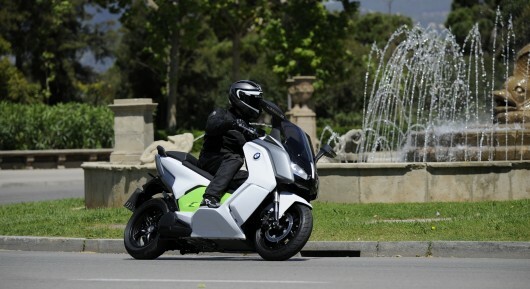 The BMW C evolution is a genuinely capable scooter and a clear indication of BMW’s strategy to further expand its electric mobility range. There’s just one outsized obstacle for it to overcome, its price, at €16,950 it is €4,700 more expensive then its petrol-powered C 650 GT relation. 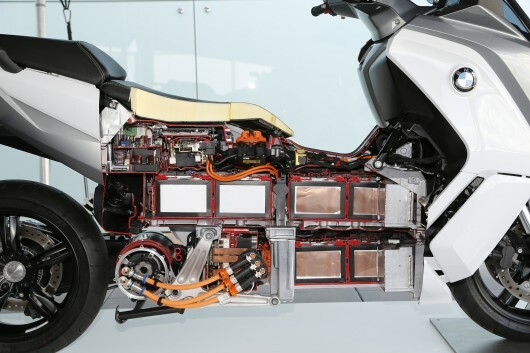 When asked if we can expect further electric motorcycles in the near future, Dorit Mangold, Product Manager C evolution was keen to emphasis our interest should be on the C evolution for now, although we may see further electric two-wheeled vehicles from the German manufacturer. From electric city cars to supercars, and now maxi scooters and mountain bikes, it’s clear to see BMW are taking their zero-emission electric mobility strategy seriously.